There's an old saying, "If you love what you do, you never work a day in your life." Chris Graham was working a job he didn't love and decided it’s never too late to get a job that you do love. He wanted to become a Nurse. Somehow, he managed to get his Nursing degree with 4 children to take care of at home. One of those children followed in his father's footsteps and graduated from the same Nursing School. The legacy will continue as another one of Chris's kids has been accepted to Nursing school. What a wonderful role model Chris is for his family. 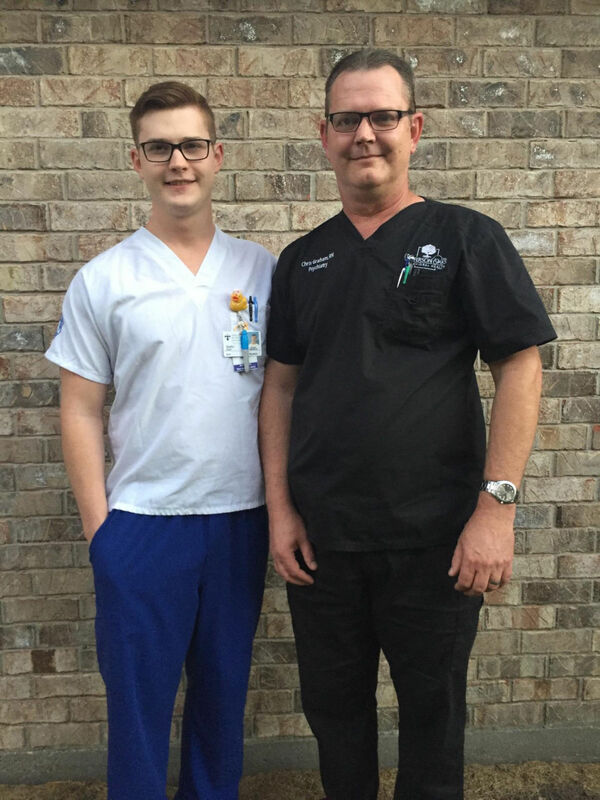 A strong connection with an anesthesiologist at the mechanic shop he worked in inspired Chris Graham to pursue nursing school, but little did he know that years later, he would inspire his son to do the same thing. Graham, a 48-year-old resident of Baton Rouge, walked across the stage to graduate from Our Lady of the Lake College in 1999, and a few weeks ago, his second son, Stefin, accomplished the same feat when he received his diploma from the newly dubbed Franciscan Missionaries of Our Lady University. Chris serves as the director of Nursing at Jefferson Oaks Behavioral Health, and Stefin has been hired to work in the intensive care unit at Our Lady of the Lake Hospital. In 1995, Chris was working at BMW of North America as a mechanic, married to a schoolteacher and the proud father of two sons, but he knew that eventually he wanted to pursue another career path. Although he didn’t know exactly which field he would pursue, Chris began taking prerequisite courses at night while working a 40-plus hour workweek at the mechanic shop. It wasn’t until he struck up a relationship with a local anesthesiologist who became a regular at the shop that he decided to turn toward the medical field. “I said, ‘Doc, I can’t go to nursing school with these kids,’ and he said, ‘Aw, yeah you can. Just put your mind to it.’ Long story short, I ended up registering at Our Lady of the Lake College, and in 1996, I took my first nursing class,” Chris said. Being accepted into the program was only the first of many hurdles he had to overcome on the long road to graduation. Chris’ hard work did not go unnoticed, since he was the first person to receive the Dr. John Beven Award for graduates who exemplify the art and science of nursing, and years later his second son, Stefin, chose to pursue the same career path. Although watching his dad was inspiring, for Stefin, the decision to pursue nursing was solidified while doing service hours as a high school senior. Growing up, Stefin always felt drawn toward caretaking roles, so the unit he chose to work on was a natural fit for him. The nursing legacy of the Graham family will be continued when the fourth Graham son, 18-year-old Austin, starts classes in the fall at Franciscan Missionaries of Our Lady University. For Chris, seeing his sons follow in his footsteps is an honor unmatched by little else.